The Marine Corps Infantry Machine Gunner — known as MOS 0331 in the Military Occupational Specialties (MOS) — handles large machine guns in direct combat. Also known as 31’s by their infantry platoon mates, these heavy machine gunners specifically handle the 7.62mm medium machine gun, the 50 caliber and 40mm heavy machine gun, plus their support vehicles. This position is within the Infantry Career Field. Those holding the position of machine gunner (MOS 0331) have ranks from private to sergeant. “31’s” tend to be bigger and stronger Marines and many do second weight lifting workouts of the day to build the strength needed to carry the extra rounds and heavy equipment. However, carrying an extra 70 lbs more than everyone else in the platoon will make you strong – slow, but strong. The added size and strength is due to the nature of their work. For example, the 240B above weighs on average 27 pounds and the 7.62 ammo loadout is twice as heavier than the .556 weapons as well. For instance, an M16A4 with scope, grenade launcher is typically around 9 pounds in comparison. The ammo of the typical grunt weighs 3.5 lbs for 100 rounds of 5.56 x 45. Also a 100 rounds of 7.62 x 51 weighs 7 pounds. Imagine now carrying 500 to 1000 rounds at a time. Spreading a 100 rounds throughout the platoon with each member is the way to go especially if everyone knows that your next patrol requires some time of being in a hot area with little support quickly on the way. Machine gunners provide direct fire in support of rifle and Light Armored Reconnaissance (LAR) squads, platoons and companies, along with infantry and LAR battalions. They can patrol mounted or dismounted. Summary. The machine gunner is responsible for the tactical employment of the 7.62mm medium machine gun, the 50 cal., and 40mm heavy machine-gun, and their support vehicle. Machine gunners provide direct fire in support of the rifle and LAR squads/platoons/companies and the infantry and LAR battalions. They are located in the weapons platoons of the rifle and LAR companies and the weapons company of the infantry battalion. Noncommissioned officers are assigned as mortar gunners, forward observers, fire direction plotters, and squad and section leaders. When on foot, the Marine Corps machine gunner is primarily responsible for the tactical employment of the 7.62mm M240 medium machine gun. If traveling by vehicle, the machine gunner fires mounted weapons (the 50 caliber or 40mm heavy machine gun). Typically, Marine Corps machine gunners operate in three-person teams, often under combat situations and frequently in difficult terrain. Machine gunners must be prepared to fight in close quarters, both on foot and from mounted positions, and also potentially from aircraft. The team leader leads the three-person team and directs the machine gunner's fire. The second person on the team, the machine gunner, employs the M240 machine gun. 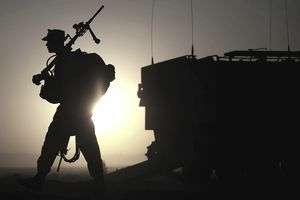 The third person on the team carries spare ammunition and barrels for the machine gunner and assists in the deployment and employment of the machine gun. When operating in small units, the machine gunner is a critical force multiplier in the squad or platoon. It is vital to survival to have perfectly operating equipment, adequate stores of ammo, and ready to replace barrels when needed. To become a Marine Corps machine gunner, a Marine must possess a score of 80 or higher on the General Technical (GT) section of the Armed Services Vocational Aptitude Battery. Being one of the stronger and bigger Marines in the platoon is not necessarily a requirement, but it fits the stereotype. Machine gunners first must attend basic training and become a U.S. Marine Corps infantry rifleman. Following basic training in either Parris Island, N.C. or San Diego Marine Corps Recruit Depot in California, machine gunners attend the Machine Gunner Course at the School of Infantry at Camp Lejeune in North Carolina or at Camp Pendleton in California. Your school's location will depend on your home base. At the Machine Gunner Course, you will be trained in military tactics, fire control and weapons systems, and how to become a team player within the U.S. Marine Corps fire team weapons or rifle platoon. (1) GT score, of 80 or higher. (2) Complete the Machine gunner Course at the School of Infantry, MCB Camp Lejeune, NC, or MCB Camp Pendleton, CA, or upon completion of appropriate MOJT. Duties. For a complete listing of duties and tasks, refer to MCO 1510.35, Individual Training Standards.